On Sunday 20th July, the final event of the Laurencekirk Gala took place. Forty competitors from local clubs, and from further afield, took part. 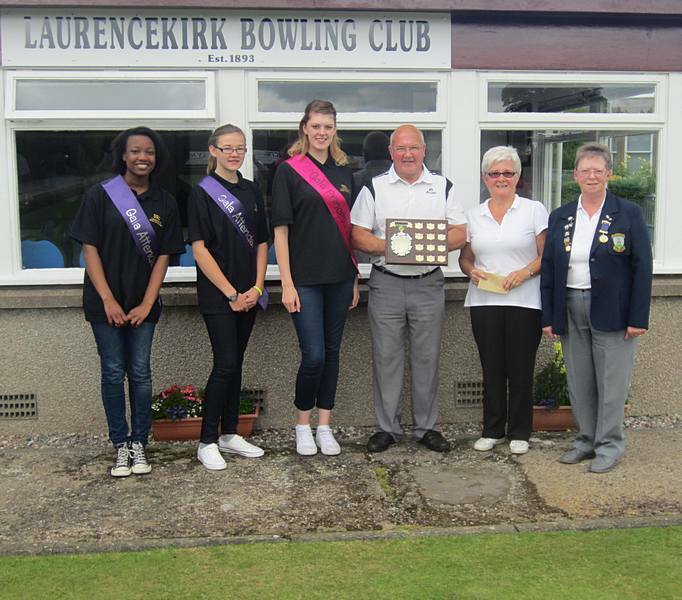 In contrast to the previous day, fine weather prevailed and, after an afternoon of very competitive bowling, Laurencekirk bowlers Isobel Smith and Doug Henderson contested the final, with Doug winning narrowly by 5 shots to 3. The competition was opened, and prizes awarded, by the Gala Princess Sarah Slessor and her attendants Hannah Mitchell and Joan Dangana. The Gala Princess and attendants are pictured below with the winner, runner up, and Club President Betty Ritchie.